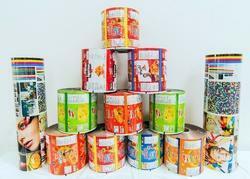 We are a leading Manufacturer of printing materials from Indore, India. To touch new horizons, they have entered into manufacturing – Flexible Packaging Materials. Flexible packaging offers the perfect fit solution to our today’s packaging needs of a consumer pack, by providing a simple and adaptable answer to portioning, preservation and demands for retail marketing of processed food, ready to eat snacks, grocery, cosmetics, etc.. They have set up a world class facility at Indore, the commercial capital of Madhya Pradesh, India with equipment to 9 colors Rotogravure reverse print on PET/BOPP Films, Laminating it with Extrusion Coating to metalized PET/BOPP, side by side manufacturing multi layer blown films and then solvent less laminating the same to the previous structure to finally get a four layer reverse printed flexible laminate for flexible packaging.